This is my planter. It took me many tries to get it to look perfect. It took me about a week to get one that didn't look like a baby monkey made it. The inside of the planter was a little thick but I wasn't sure how to make the inside thinner without messing the whole project up. 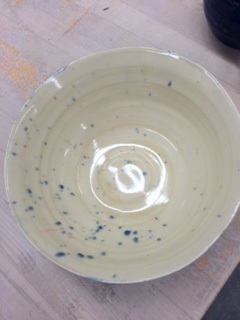 But the glaze went on thick and even so i am happy with the out come of that. the depth of the project is compromised with the color used, it looks smaller on the inside of the outside wall. These are my two bowls, the second one is much bigger than the first one. The glaze on the first one was meant to be all brown but i put it on the wrong shelf and someone else put green glaze on it before realizing it wasn't theirs. 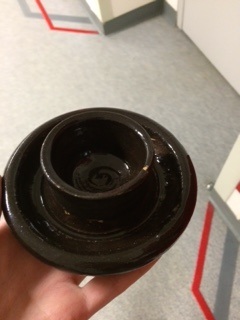 The bowl is very even and smooth and the lip is not cracked and is not too thick. The second bowl is my favorite thing I have made so far. The lip is pretty thin so i was very worried that it was going to crack or break but thankfully it didn't. 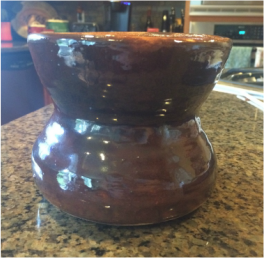 the glaze is a very fun glaze and the white makes the bowl bigger in the inside and the stripes on the outside makes the bowl look taller than it is. 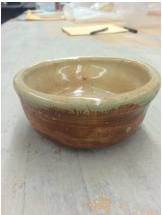 The inside has a little ring from my fingers but it works with the glaze. This is my cup with a pulled handle. 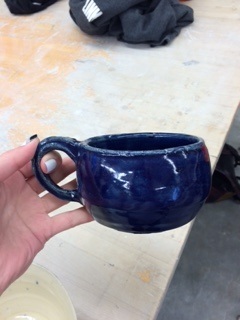 The handle and the lip of the cup cracked quite a bit during the glazing process so it is kind of rough to the touch. 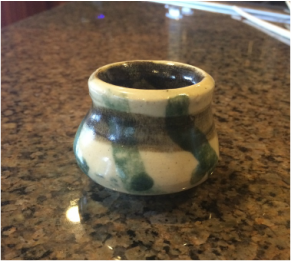 But everything else about the cup is fine, the footing is even, the glaze is a little splotchy but over all the color of it gives the cup more depth than it has. 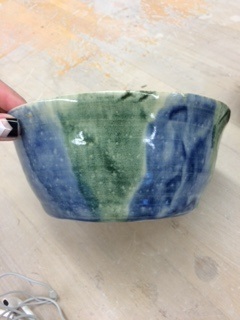 When I was making this cup I wanted it to be rounder than a cup normally is and I think i pulled it off quite well but because of the glaze it does not look as round or as smooth as it really is. 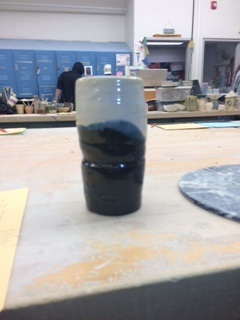 This is my small vase from the first quarter. It is a lot smaller than I originally intended because I broke the original one when it was still on the wheel so i decided I would just make a smaller one. There are two different patterns on the vase because I first put the dots and brown streak on but I did not have anything down underneath it. I dipped it in clear glaze but the next day I thought it was a white glaze so i quickly put the green streaks on it. The color on the inside makes it look much bigger on the inside than it really is. I did manage to choke what clay there was but as i went to foot it i pressed too hard on one side so it is now a little uneven in the middle but over all it isn't too bad. 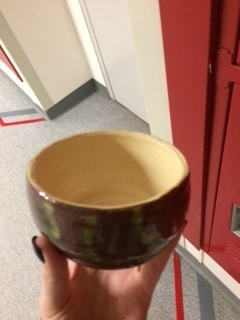 It took me longer than expected to get it out of the kiln because i lost it on the glazing shelves for a couple weeks.